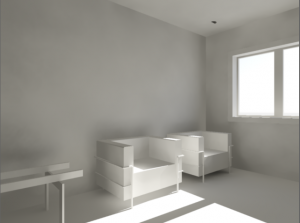 We covered how you can create Classic workspace in AutoCAD 2015. We covered two methods in that article: migrate from previous version and create your own workspace using command line. 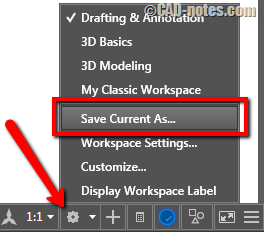 If you are familiar with AutoCAD Customize User Interface (CUI) and prefer not to use command line, you can also create workspace using CUI. This probably is easier if you prefer to work in graphical user interface instead of typing the command. 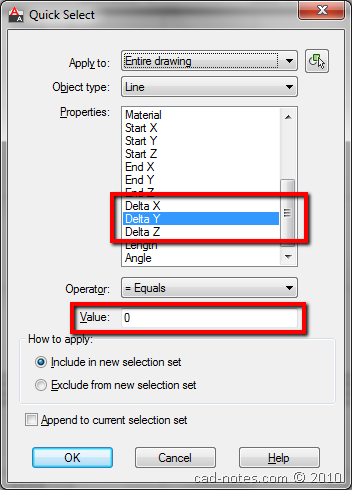 Open AutoCAD CUI by typing CUI then enter. Or you can access it from AutoCAD ribbon> Manage Tab> Customization Panel> User Interface. After you open CUI dialog, find Workspaces group below ACAD.cui. Right click Workspaces, then choose New Workspace from context menu. Rename the new workspace with relevant name. You already have a new workspace, now it’s time to define what UI elements should be included here. 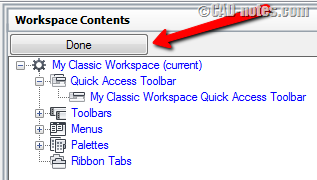 Right click the new CUI, choose Customize Workspace from context menu. Now you will see checkboxes in front of the UI elements. Check the elements that you want to include in your workspace. For Classic Workspace, you will need menus and toolbars. Check the menus and toolbars you want to show in your workspace. You can also include the ribbon tabs if you want to. Click OK to close CUI dialog box if you have done working with CUI. If you want to continue working with it, modifying other workspace, you can click done and continue working. 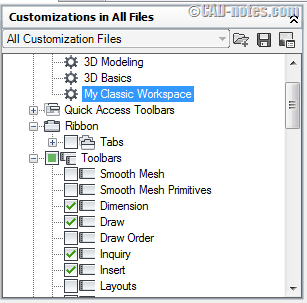 Customizing workspace with CUI allows you to add and remove UI elements. But it doesn’t allow you to position the toolbars. Now you need to move the toolbars, dock them to your preferred locations. You also need to close the ribbon, which is opened by default. Type RIBBONCLOSE to close it. 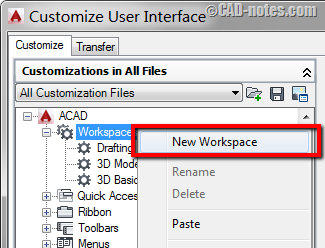 AutoCAD will ask you for workspace name. Do not type a new name, but choose workspace you created previously from the list. Click save. AutoCAD will ask you for confirmation if you want to replace it. Click Replace. Now you finished creating your own classic workspace! Certainly you can use it to create your own workspace with ribbon interface too. If you want to learn more about CUI, you can learn more about it in this tutorial.